The third-ranked Nebraska volleyball team opened Big Ten play with a 3-1 (25-19, 25-27, 25-17, 25-12) win over No. 18 Michigan on Friday night in front of a crowd of 8,392 at the Bob Devaney Sports Center. Mikaela Foecke paced the Huskers (10-1, 1-0 Big Ten) to their 10th straight win with 21 kills on .391 hitting with nine digs and six blocks. Lexi Sun had 14 kills and a career-high 16 digs with four blocks, and Jazz Sweet terminated 11 times and added three blocks. The Wolverines (11-1, 0-1 Big Ten) suffered their first loss of the season. Nebraska had a dominant edge in hitting percentage, .314 to .135, and in blocks, 14-6. Nicklin Hames had 44 assists and 10 digs and served three aces. Callie Schwarzenbach had four kills and a match-high eight blocks, and her fellow middle blocker Lauren Stivrins chipped in seven kills and six blocks. Libero Kenzie Maloney had 16 digs to lead the Huskers to a 67-56 advantage in that category. Carly Skjodt led Michigan with 13 kills. Set 1: The Huskers got off to a strong start by taking a 7-2 lead. 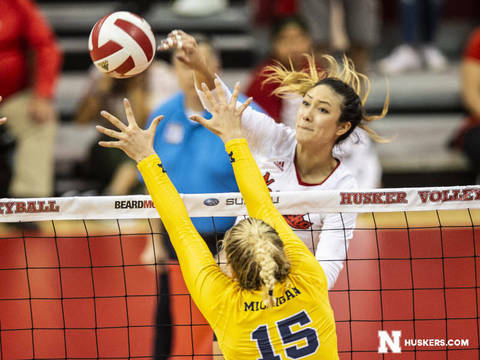 Hames served two aces and set the Huskers to four kills on five attacks. After a timeout, Michigan scored six of the next seven points to tie the set at 8-8 and force a Husker timeout. The Huskers never fell behind though and won an entertaining rally with a stuff block by Schwarzenbach and Sweet to make it 14-11. Ahead 16-15, the Huskers reeled off a 4-0 run to go up 20-15 with Sun contributing a block and a kill during the run. Foecke crushed an overpass for a 23-18 lead, and the Huskers won 25-19 on a block by Foecke and Schwarzenbach. Set 2: Nebraska found itself ahead with a familiar score line, 7-2, once again after a pair of blocks by Stivrins. But also just like the first set, Michigan came roaring back and took a 10-9 lead, its first lead of the match, after a 7-1 run. The Wolverines then pushed their lead to 15-10 with a 5-0 spurt. Foecke, Sweet and Sun terminated on consecutive rallies, and Sweet and Schwarzenbach then combined for a block to cut Michigan’s lead to 16-15. After a Michigan timeout, Sun scored again to tie the set at 16-16, capping a 5-0 run. The teams traded sideouts until Stivrins fired from the right side to give NU a 19-18 lead. Michigan reclaimed a 23-22 lead on a Sydney Wetterstrom kill, and then Mackenzi Welsh served an ace for set point. But Welsh served into the net to make it 24-23, and Michigan hit wide to tie the score at 24-24. The Wolverines won 27-25 after Skjodt recorded three kills to close out the set. Set 3: Nebraska held a 15-12 lead at the media timeout after an 8-4 run that included three kills by Foecke. The senior captain then went off for three kills in a span of four rallies to put the Big Red up 20-16. After a timeout, Sweet put away back-to-back kills and Schwarzenbach and Foecke combined for back-to-back blocks for a 24-16 lead, and Nebraska won 25-17, ending the set on a 7-1 run. Foecke had eight kills and no errors in the set, while Sweet had four kills and no errors. Set 4: A pair of kills by Sun and an ace by Maloney put the Huskers up 6-2, and Stivrins and Sun connected on back-to-back kills to make it 8-3. Nebraska went up 13-5 after Foecke and Schwarzenbach recorded kills and teamed up for a block, forcing Michigan’s final timeout of the set. Sun blasted two more kills and Stivrins another as the Huskers went up 19-9. NU capped off a dominating final set at 25-12, out-hitting the Wolverines .467 to .118. Up Next: The Huskers are back in action against Michigan State on Sunday at 2 p.m. at the Bob Devaney Sports Center. The match will be televised on ESPNU, streamed at WatchESPN.com, and will air on Husker Sports Network radio affiliates, Huskers.com and the official Huskers app.